A very controversial food. We serve food at all of our workshops including a full sit-down lunch with dinner style food during each four-hour workshop. We serve food for several reasons. Since many of our students are still teenagers, they need to eat well and often. 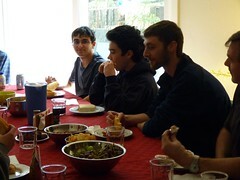 We also use the sit-down meals as a socializing and social skills opportunity. In our home life Janet and I are on a strict gluten-free, casein-free (effectively dairy-free), corn free diet which we undertook on behalf of our son. Ian benefitted greatly from this diet and it allowed him to transition to being medication-free and improved his performance in school. For ourselves, we have found this to be a very healthy diet and plan on continuing. I say this mainly to indicate that Janet and I were predisposed to look hard at foods we serve and observant of their effect on the students. Many of our students, perhaps 25%, need some small amount of food nearly hourly. At the studio this will be in the form of potato chips and fruit snacks. When they have this food handy they are better able to attend to their work and their behaviors are calmer. That said, about 10% of our students will noticeably over-eat if the food is not limited. Not surprisingly, these same students are overweight. Sugar seeking overlaps general food seeking habits in our students in a complex way. We long ago banned sugar and sugar free soda but make unsweetened fruit juices and seltzer water freely available. However, one day a parent brought a cold case of Coke-a-cola to the studio for a pot-luck later in the week. Probably 75% of our students (including ALL of the overweight overeaters discussed above) displayed a complete lack of control about grabbing for the cokes and also drank several each. This frenzied behavior reinforced our commitment to keeping these drinks out of the studio. The “fruit” juices have some perils too. Bought before we looked at it carefully, a lemonade we buy at Costco turns out to be sweetened with cane sugar and causes the same grabby/frenzy behavior we don’t like about sodas. It is otherwise not too bad so we experimented and have found that diluting it about 25% with water vastly reduces the grabby behavior so we surreptitiously dilute all the bottles before they get to the lunch table. Grape juice has the same problem and we dilute it as well, and again this reduces the “pull” almost all of the students are helpless to. Once they eat the food – does it help or hinder? Most students benefit from having healthy-ish food handy. By “healthy-ish” I’m including snacks like potato chips. For our chronic over-eaters (again about 10% of our students) they eat to diminishing returns: they eventually eat until they suffer some sort of food crash so the overeating affects their productivity and they show reduced energy but their mood appears well regulated (no outburst). Once we have determined that someone is an overeater we gently regulate the amount of food they eat so that the overeaters end up with portions similar to the other students. For most of the students, sugar affects them pretty much the same as other snacks, which is to say that mainly it has a positive/neutral impact on their mood and functionality. This is somewhat in contrast to a lot of information out there regarding sugar but this is our experience. 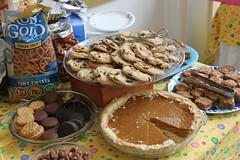 However, for about 10% we see a “sugar crash” almost immediately, practically before they finish the sugar loaded food. Their crash consists of low energy, reduced ability to attend, reduced ability to avoid OCD behaviors, and foul mood. This group clearly should never eat sugared food and yet they constantly seek such foods. An example is a student who would drench their meat dish (usually chicken) with a BBQ sauce that was heavily sugared. By the end of the meal this individual would be in a sugar crash and would be grumpy and unproductive for the rest of their studio time that day. Overall: going low or no sugar is certainly a safe choice. Fruit is great but even junk food such as chips seems to be at worst neutral – as long as they are not overeaten. Individuals who are sugar sensitive clearly must avoid sugar to remain effective and productive. For those individuals we will be working closely with them and their families to come up with strategies to avoid those foods that do not work for them. As I said above, this is our experience observing the students we work with. Your mileage may vary. This entry was posted by Dan Swearingen on Wednesday, May 23rd, 2012 at 8:05 pm	and is filed under Diet & Exercise. You can follow any responses to this entry through the RSS 2.0 feed. Both comments and pings are currently closed.